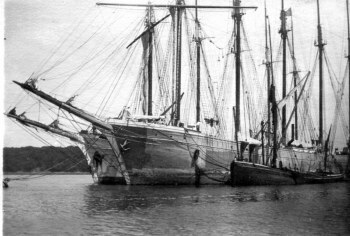 Two large schooners, possibly Scandinavian, lying at one of the buoys in Buttermans Bay in the Orwell below Ipswich, with a sprits’l barge alongside. These buoys were mainly used by steamers that were too large to enter the Wet Dock when fully loaded and had to discharge their cargoes into sailing barges and lighters while lying in the Bay. 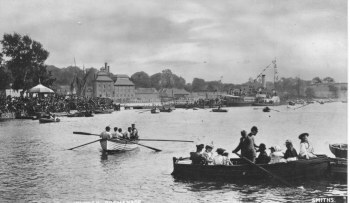 The Great Eastern Railway paddle steamers Norfolk, Suffolk and Essex at their moorings in the New Cut at Ipswich in the first decade of the twentieth century. They operated a regular passenger service from Ipswich to Felixstowe and Harwich. 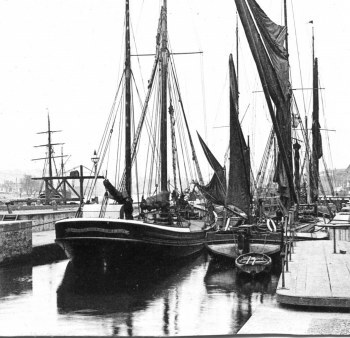 Sailing barges locking into the Wet Dock in the 1890s. On the left is a large boomie barge and on the right a small sprits’l barge possibly bringing a cargo of grain from a steamer in the London Docks. A boomie barge unloading a cargo of coal on Pin Mill hard for distribution in the village of Chelmondiston and the surrounding country area. 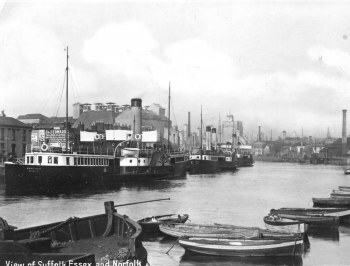 Such barges were well capable of trading with the Tyne and Wear. 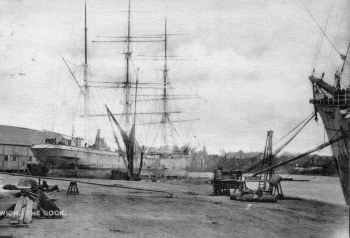 An unidentified three-masted barque lying at the South West Quay in Ipswich Dock.